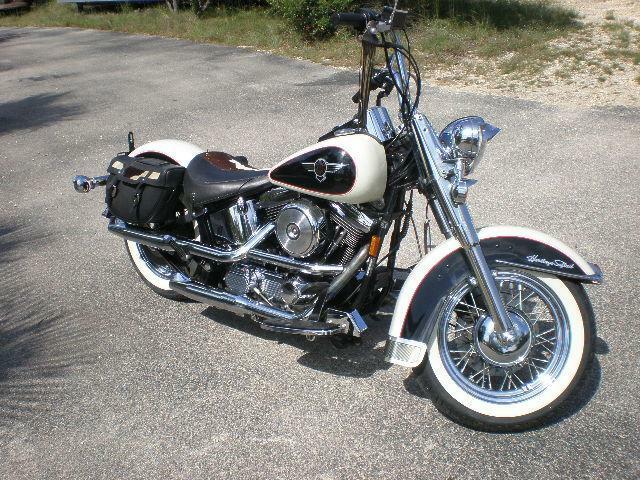 1993 Harley FLSTN Softail Classic Nostalgia Limited Edition ’’Cow Bike’’or ’’MooGlide’’, #1633 of 2700. I have had a number of these as I think they are way cool as well as a great investment. Every other bike Harley makes is a collector edition of some sorts, but the 93 Cowbike truly is a Harley collector bike. They were an instant sensation when they came out in 93, and still are today. They will only go up in value from here. This is the first one that I have had that does not have any cracks around the saddlebag mounting holes from overtightening. The seats were taken off and stored when it was new, so they are brand new. I have another original Cowbike seat on it now that is pretty decent as well. It is very clean, very original, unmodified, aside from a few bolt on items, and a bike that will appreciate in value while you enjoy it. It draws interest everywhere it goes. When was the last time you saw one? I also have many of the impossible to find Harley cowhide accessorys that were only made in 93 available to the buyer of this bike. Price just reduced to $11900, I need to sell something........... it now has a little over 14k miles and I ride it regularly. You can fly in and ride it home anywhere.